LED HEAD KIT FOR Hercules Devastator. Generation Toy. It is fast,easy and safe. if you use e- check on paupal as we will hold your order unit your e-check clear. Combined head with LED Light 1. It will surely be the most popular combiner in the market and the price will go very high after that. After obtaining your approval, I will send it out. Under normal circumstances, the project can reach you in good condition. I sincerely hope that you can understand. I sincerely hope that my service can make you satisfied. Apply age: more than 8 years old. we will try our best to give you a satisfied solution within 24 hours. Quantity: 1pcs. Best Price. best service. Such a nice item is best suited for personal collection or a valuable gift,a display as well.Believe it will bring you much pleasure ! Category: decepticons. We will respond within 24-48 hours, in most cases sooner. GT-1C Navvy Hercules. Note: This product contains only GT - 1 C Navvy and its accessories. Hercules Devastator. Generation Toy. Rubber tires,transparent window,human height of about 17cm. You will be greatly appreciated. Type: shape-shifting toy. We will do our best to reduce the risk of tariffs. Age range :10 years and above. We believe that any problems will be solved through communication. Material: plastic. Fashion design, 100% new, high quality! TFC TOYS S.G (Safe Guard Perseus) Parr Hughes gift edition. We will respond within 24-48 hours, in most cases sooner. Hercules Devastator. GT-1D Bulldozer Hercules. Note: This product contains only GT - 1 D Bulldozer and its accessories. Generation Toy. Rubber tires,transparent window,human height of about 17cm. You will be greatly appreciated. Hercules Devastator. Generation Toy. You will be greatly appreciated. We will surely solve the problem for you satisfactorily. It will surely be the most popular combiner in the market and the price will go very high after that. Hercules Devastator. Generation Toy. Note: This product contains only GT - 1 B Mixer truck and its accessories. You will be greatly appreciated. We will surely solve the problem for you satisfactorily. Hercules Devastator. GT-1E Dump Truck Long Haul Hercules. Generation Toy. You will be greatly appreciated. We will surely solve the problem for you satisfactorily. 100% ORIGINAL ITEM. Rubber tires,transparent window,human height of about 17cm. You will be greatly appreciated. We will surely solve the problem for you satisfactorily. It is fast,easy and safe.if you use e- check on paupal as we will hold your order unit your e-check clear. All item are top quality, hope to deal with you. I will give you the best solution. Orders processed within 24-72 hours. When you receive your item. Collectibles toys. We stand behind our products and our service. MATERIAL: ABS. IF YOU NEED IT AS NEW/GIFTS. Australian Money Order. Should you change your mind, decide you do not like the colour or for any other reason you no longer want the product. 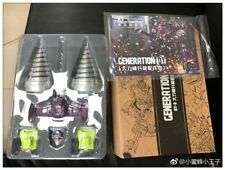 Generation Toy GT-01 GS Devastator Hercules Clear Green Shadow Full Set New. Hercules Devastator. Character : Hercules. Perfect Effect. Generation Toy. You will be greatly appreciated. We will surely solve the problem for you satisfactorily. Applicable age: 3 years old or older. Category: Decepticons. Product Attribute: Subject. Hercules Devastator. Generation Toy. It will surely be the most popular combiner in the market and the price will go very high after that. All item are top quality, hope to deal with you. Orders processed within 24-72 hours. It is mint in sealed box. factory sealed. This is the first edition/run. Which is why you get the extra part for scavenger. What you see is what you get. If the box is under 16oz. If it's over 16oz. Has been opened to take pictures. Never played. ROBOT SIZE: APP 22CM. We stand behind our products and our service. IF YOU NEED IT AS NEW/GIFTS. MATERIAL: PVC & ABS. Should you change your mind, decide you do not like the colour or for any other reason you no longer want the product. If you are not happy with your purchasing. Anything can be resolved through communication, we will do our best to solve the problems. Such a nice item is best suited for personal collection or a valuable gift,a display as well.Believe it will bring you much pleasure ! Apply age: more than 8 years old. Category: decepticons. And we will do our best to solve the problem and give you a satisfying answer. Such a nice item is best suited for personal collection or a valuable gift,a display as well.Believe it will bring you much pleasure ! Apply age: more than 8 years old. Category: decepticons. We will respond within 24-48 hours, in most cases sooner. Such a nice item is best suited for personal collection or a valuable gift,a display as well.Believe it will bring you much pleasure ! Category: decepticons. And we will do our best to solve the problem and give you a satisfying answer.